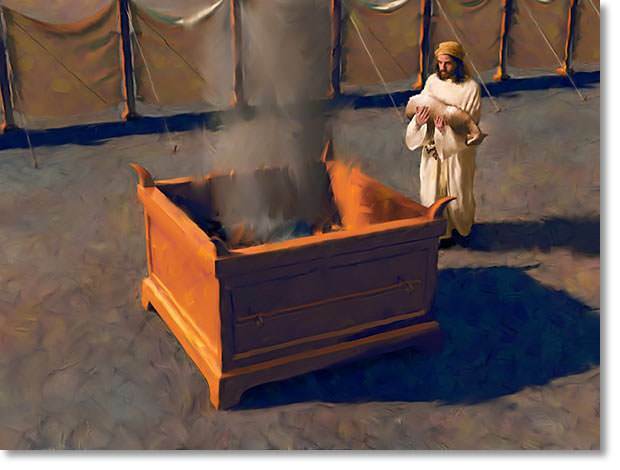 In order to get a clear picture of what was happening in the tabernacle and to know how the incense was made to have true value, we must go back and a look at the brazen altar. For there the work of Christ began, where He suffered and shed His blood and died, purging our sins. Thus the brazen altar is a type of the cross, which was Christ’s first work in God’s whole plan for our redemption. The brazen altar, the place where animals were sacrificed, was made of brass and had no crown; thus it speaks to us of the suffering and humiliation of our Lord on earth. But the golden altar, with a crown of gold, speaks to us of the reigning of Christ in heaven. The blood from the sacrifices of the first altar was symbolic of the blood of Christ; the incense of the second altar was symbolic of the presence and the prayers of Christ. While the brazen altar foreshadows Christ’s work upon the cross (the work of paying the penalty for our sins, by which He bought us with His own blood), the golden altar foreshadows His work in heaven (interceding for us). Now the Bible says, “Without the shedding of blood there is no forgiveness of sins” (Heb. 9:22). This is illustrated quite vividly in these two altars. 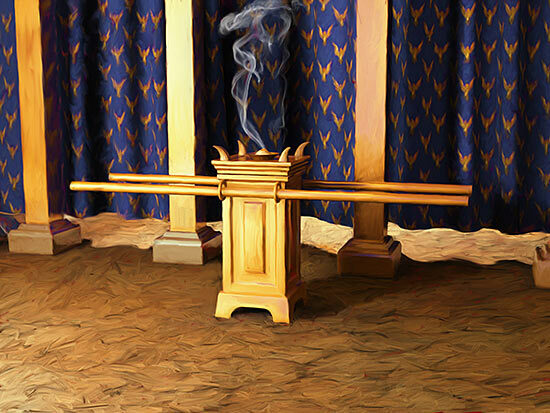 For the incense of the second altar was ignited and burned by the fiery coals of the brazen altar. No other source of fire would suffice—would give the incense value (for forgiveness of sins). Furthermore, once a year the blood from the brazen altar was taken and applied to the horns of the golden altar (Ex. 30:10; Lev. 16:18) giving the incense and the prayers value and power. Therefore, what is illustrated in these two altars is how the work of Christ at the cross has given His intercession in heaven true value. What Christ does now in heaven is based on the blood of Calvary. His shed blood makes His prayers, and likewise our prayers, effective. This entry was posted in Answers to Prayer, Prayer A to Z Excerpts and tagged effective prayer, prayer, the altar of incense, The brazen altar, the cross of Christ, the tabernacle, the work of Christ. Bookmark the permalink. Thanks for this wonderful insight, Stephen. It seems that in O.T. typology copper (which is the main ingredient in brass and bronze)points to judgment, silver to redemption, and gold to glory (i.e., God’s glory). Without substitutionary propitiation (i.e., satisfactory payment) justice would be unsatisfied; and without full payment (which is the basis for Christ’s TETELESTAI-based resurrection) there would be no redemption, and without full redemption there would be no glorification in Heaven. Thanks be unto God, Christ is our propitiation, our redemption, and our glorification (1st Corinthians 1:29-31). Thanks James for this additional insight.